Alpine Desert After spending a night under the imposing Great Barranco Wall, you climb this awesome obstacle, which turns out to be easier than it looks. Topping out just below the Heim Glacier, you can now appreciate just how beautiful Kilimanjaro really is. The route then heads down through the Karanga Valley and goes over intervening ridges and valleys to join the Mweka Route, which will be your descent route. You have now completed the South Circuit, which offers views of the summit from many different angles. For now, all eyes are still on the summit, so turn left and hike up the ridge for another hour to the Barafu Hut. 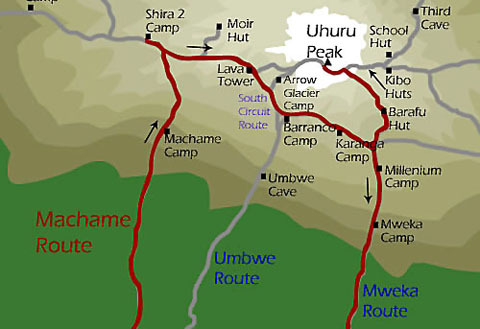 The last water on the route is in the Karanga Valley; there is no water at Barafu Camp, even though Barafu is the Swahili word for “ice.” The famous snows of Kilimanjaro are far above Barafu Camp near the summit of the mountain. Your tent will be pitched on a narrow, stony, wind-swept ridge, so make sure that you familiarize yourself with the terrain before dark to avoid any accidents. Prepare your equipment and warm clothing for your summit climb. This should include replacing your headlamp and camera batteries, and to prevent freezing, consider carrying your water in a thermal flask. Go to bed by 7 PM, and try to get a few hours of precious sleep. to Highview Hotel Drive 30 minutes from the Highview Hotel to the gate for Ngorongoro Crater. On the eastern side you will see the Rift Valley, elephant, buffalo, zebra, monkey, birds, as well as viewing the crater rim. Tanzania’s best concentration of wild animals is in Ngorongoro’s huge, perfect crater. This is also the best place in Tanzania to see black rhino as well as prides of lion that include the magnificent black-maned males. There are lots of colorful flamingoes and a variety of water birds. Other game you can see include leopard, cheetah, hyena, other members of the antelope family, and small mammals. In the afternoon, drive back to the Twiga Camp for lunch, then In the evening, you can enjoy a walk through the coffee plantations while birdwatching. Retire to the Simba Camp or the Highview Hotel for dinner and your overnight - full board. to Highview Hotel Choose from a hiking and cultural tour in Karatu, or hiking in the Empakai Crater. Karatu: After breakfast, take a walk through coffee plantations, enter the highlands around Karatu for birdwatching, then return to your camp or hotel for a rest and lunch. In late afternoon, take another walk to local waterfalls or watch the cultural dances of the Iraqw people. In the evening, drive to Karatu Camp or the Highview Hotel for dinner and overnight. Empakai: After breakfast, drive through the highlands to the rim of the Empakai Crater. With its deep, very blue lake ringed by flamingo, Empakai is one of the most dramatic and beautiful treks in Tanzania. Walking across this unique forested crater on foot, you will marvel at the variety of wildlife and fauna. In the evening return to Karatu Camp or the Highview Hotel for dinner and overnight - full board. or Kilimanjaro Airport The drive from the Highview Hotel to Tarangire National Park takes three hours. This park is spectacular in the dry season when many of the migratory wildlife species come back to the permanent waters of the Tarangire River. Huge herds of wildebeest, zebras, elephants, elands and oryx gather to stay in Tarangire until the onset of the rain when they migrate again to good grazing areas. Then in the late evening drive back to the Springlands Hotel in Moshi or the Kilimanjaro Airport to catch your flight home.